Sotheby’s, Christie’s and Phillips raised $784.5 million during their three Post-War and Contemporary evening sales in New York last week, against a pre-sales estimate of $693.2 m – $904.6m. This was 3.6% higher than May 2017. Christie’s came in with the highest market share this season, accounting for 45.9% of total sales (down from 51.3% in May 2017). 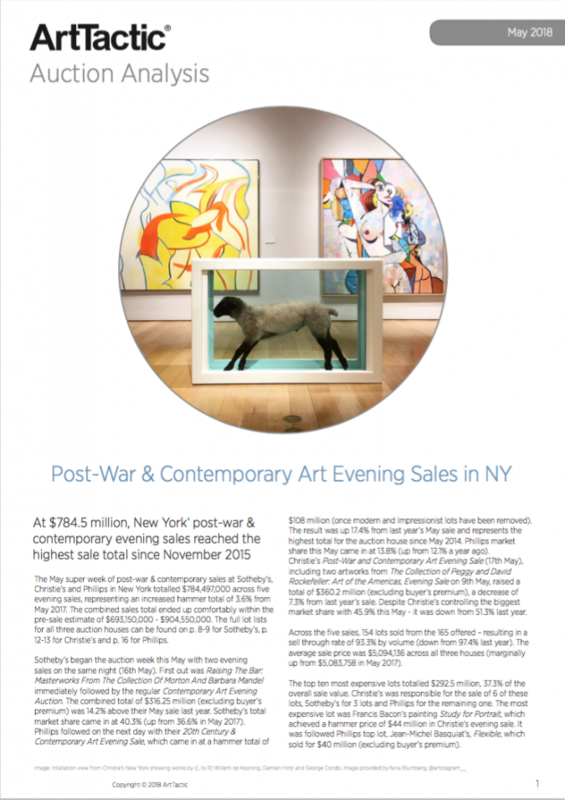 This report presents an in-depth comparative analysis of the Post-War & Contemporary art evening sales at Christie’s, Sotheby’s and Phillips in New York in May 2018. 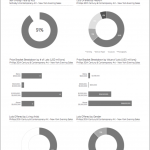 The analysis also provides analytical tools looking at annual trends between 2007 and 2018. 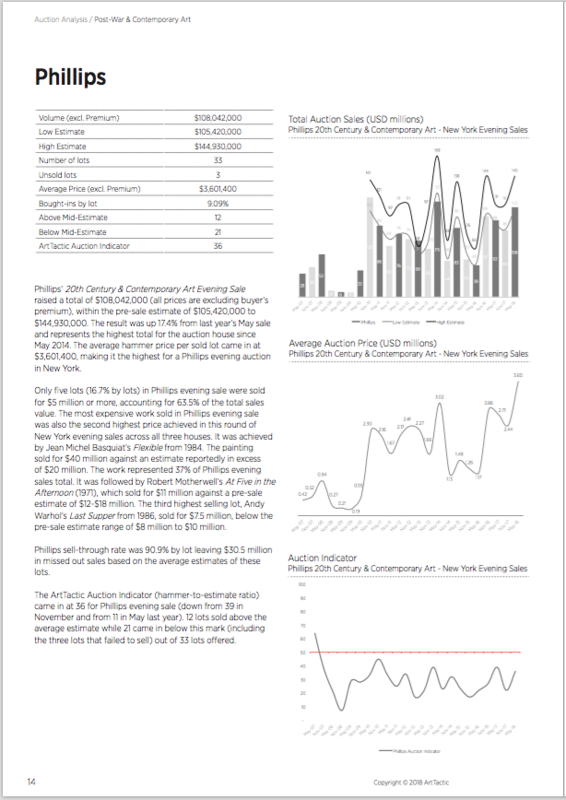 This report is popular among dealers, auction houses and collectors, who want to get an in-depth understanding of auction trends in the Post-War & Contemporary art auction market and follow the performance of the top three auction houses in the first 5 months of 2018. 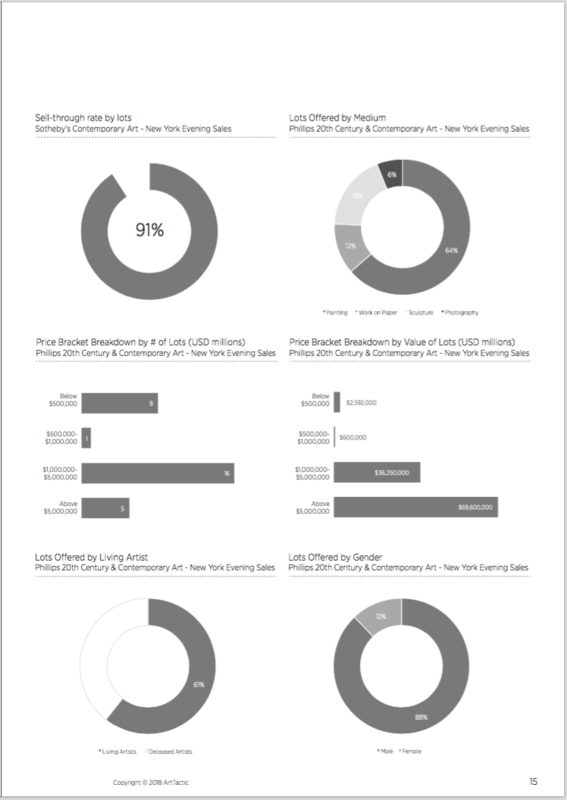 Comparable Performance: Post-War & Contemporary art auction sales performance comparison between Sotheby’s, Christie’s and Phillips in New York including: Total sales vs Estimates, Average Prices and level of Guarantees. 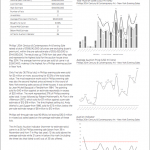 Auction Guarantee Analysis: Auction guarantee breakdown and analysis for Sotheby’s, Christie’s and Phillips.